Scrutiny follows anyone and everyone. No one is exempt from it, whether you're J.J. Abrams, a decorated Olympian or a time-honored heavy metal act. All fall under the microscope, and each have their devotees and detractors champing at the bit to toss their two cents into any forum fostering commentary. Since Rob Halford’s 2003 return to JUDAS PRIEST, the metal legends have been fastened under the microscope, each album from "Angel of Retribution" forward being met with both defense and condemnation. For all the praise heaped upon 2014's "Redeemer of Souls", there are still nooks and crannies where raspberries blow. 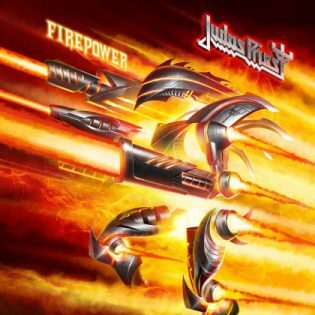 Yet a decidedly unanimous vote of approval has rung for guitarist Richie Faulkner, who brings an upswing in energy to JUDAS PRIEST, live and now on the band's 18th studio album, "Firepower". JUDAS PRIEST has been dealt some harsh hands recently including the death of former drummer Dave Holland and inexplicably losing out to BON JOVI in this year's induction class into the Rock And Roll Hall Of Fame. Most significant is the degeneration of 70-year-old Glenn Tipton's battle with Parkinson's disease. Diagnosed a decade ago, Tipton has bravely soldiered through, yet the announcement has come as of this year that he is retired from touring with JUDAS PRIEST. While Tipton remains optimistic about an occasional cameo on the road, the bitter news is an interjecting exclamation point in the way of an album that has found itself—for a change—outside of the crosshairs. Instead, a vast majority of metal fans have been stoked by early previews of "Lightning Strike" and the title track. Andy Sneap, one of the bright stars in music production today, and ACCEPT’s unheralded savior, will be filling in for Tipton on JUDAS PRIEST's upcoming tour. Even more notable is Sneap's involvement in "Firepower"" as co-producer alongside Tom Allom. Allom was responsible for JUDAS PRIEST’s halcyon recordings; his last studio album with the band was 1988’s "Ram it Down". Together, Sneap and Allom, along with the dynamic songwriting team of Richie Faulkner, Glenn Tipton and Rob Halford, have engineered the most urgent and streamlined JUDAS PRIEST album in ages. You can't ask for a better opener than what JUDAS PRIEST offers with the popping title cut, ignited by Scott Travis's trusty gallops. He's particularly fierce on the choruses and Glenn Tipton and Richie Faulkner's roaring solos. Rob Halford, never short on munitions himself, leads a prevailing bombardment, "fighting for peace" in a time when humanity needs it more than ever. Even Ian Hill sounds more animated, and though his rhythm behind "Lightning Strike" is subtle behind the pulverizing guitars, he plows, along with Scott Travis and Rob Halford. ACCEPT as well as classic JUDAS PRIEST are stuffed into these muscular tracks, ditto for "Evil Never Dies", which turns down the heat of its predecessors only to let the pulse hum. The choruses of "Evil Never Dies" are destined for the venerated halls of JUDAS PRIEST canon, if for nothing else, Rob Halford's exultant snarls. The way this song finishes is better than most younger bands' entire repertoires. Due credit goes to Richie Faulkner's vivacious songwriting, along with Andy Sneap, who brings the same rejuvenation efforts here as he has to ACCEPT’s the Tornillo era. "Never the Heroes" carries a "Defenders of the Faith" ideology into 2018 with mature attention to complex transitions, while "Necromancer" culls from "Ram it Down”, "Painkiller" and "Angel of Retribution". The band hammers out a traditional power stomp on "Children of the Sun", dropping a somber yet pointed slowdown you don't see coming. JUDAS PRIEST turns the album on its ear with "Guardians", a majestic, piano-escorted instrumental, which serves up the nervy quasi-ballad, "Rising From Ruins". While some may love, and others may despise "Blood Red Skies" from "Ram it Down", the songwriting on "Rising From Ruins" is lovingly mirrored and regaled with spectacular guitars and a heated bass line. Though keys are a characterizing accent in "Rising From Ruins", by no means are they the absolute as on the synth-charged, call-to-arms bravado of "Blood Red Skies". While the tempo of "Flamethrower" stays checked down, the band's continued vigor is evident, from Rob Halford's phenomenal yelping and shrieking to the song's banging chord patterns. "Spectre" skulks even slower but is no less heavy. The song superbly bridges "Stained Class" JUDAS PRIEST to this new regime, one where Richie Faulkner is his own man, and his elder compatriots rally behind him instead of vice-versa. "Firepower"'s recurring theme of old values in conjunction with contemporary is so incisive it's no wonder the quixotic closing epic, "Sea of Red", is erected as this period's "Beyond the Realms of Death". While "Redeemer of Souls" was an outstanding coming out party for Richie Faulkner as a full-fledged force in JUDAS PRIEST, "Firepower" is every much his and the entire band's triumph—as it Andy Sneap and Tom Allom's. Seldom do two cross-generational minds come together for a common good with both men's ideals ringing clearly and congenially, while leaning heavily upon the heritage sound. This event between Sneap and Allom is to be considered historic with results so lucrative. Let the tolls chime audaciously as they do behind Richie Faulkner and Glenn Tipton on the valiant "Traitor's Gate": JUDAS PRIEST has every reason to be proud of itself. The corpulent swagger of the retro rock-heavy "No Surrender" is so good it can choke you up, and it says everything about this album and its constituents. Glenn Tipton, you noble warrior, what you and your brothers leave here is hardly the end.